Some surviving 18thc dresses have become internet celebrities (I'm thinking of all the beautifully photographed dresses from the websites of the Metropolitan Museum of Art, the Kyoto Costume Institute, and the Los Angeles County Museum.) 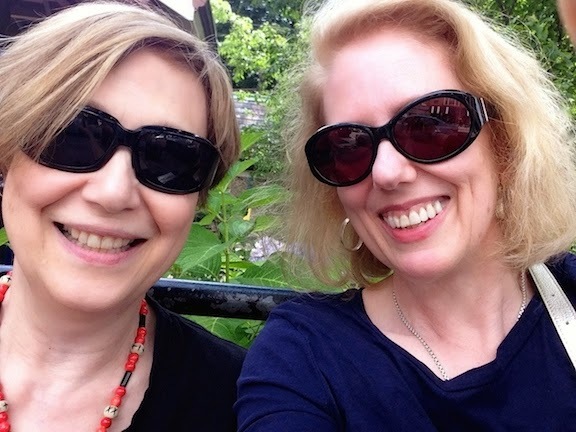 Thanks to social media and blogs like this one, these dresses are instantly recognizable - old friends of silk damask and lace - by costume historians, re-enactors, historical seamstresses, and anyone who just likes a beautiful, beautifully made garment from the past. This dress, upper left, deserves to be as well known as her more publicized sisters. I've heard about this dress in costume circles for years ("The PEARLS", whispered in hushed awe), and I finally had the opportunity to see it in person at Winterthur Museum this past fall, thanks to Linda Eaton, John & Marjorie P. McGraw Director of Collections and Senior Curator of Textiles. As always, click on the images to enlarge. The rumors were right. It's stunning. The dress is a saque, or sack gown, made between 1765-1775, most likely in France. There are so many layers of texture and embellishment in this single dress. To begin with, the fabric (see detail, right) is a purple plain weave silk with a brocaded lace and flora design in white, yellow, orange, green, red, and pink textured yarn. It almost appears to be elaborate embroidery, but all those flowers are in fact woven into the fabric. The dress has several different kinds of trims. Around the neckline and edging the skirt is gathered lace, and loops of green silk cording. There's a different kind of gauze-like lace gathered into poufs on the skirts, (see detail, left) and the poufs are in turn decorated with silk tape or ribbon that has been hand-painted with red and purple c-scrolls, vines, and medallions. The tape is exquisite, the work of a highly skilled specialist, and I can't imagine how long it must have taken to paint such delicate detail. If that isn't enough, there are strands of pearl-like glass beads threaded through the other trimmings. There was some question whether the pearls were a 19thc addition, when the dress could have been used as a fancy-dress or theatrical costume, but it was finally determined from the stitching and the beads themselves that they are in fact an 18thc embellishment, though likely added about ten years after the dress was originally made. Strands of faux pearls on dresses are shown in many 18thc portraits, but I'd never seen a dress with any still in place. When the next generation plundered an older dress, I'm sure glass pearls were among the first things cut off for reuse. I also liked how the sleeve flounces were lined with a contrasting plain-weave blue silk. The flounces had an extra little secret, too, bottom right. Sewn inside each flounce was a flat, oval-shaped, lead weight, covered in fabric, that made the flounce hang correctly from the wearer's arms. Like all the most sumptuous 18thc clothing, it's the little luxurious details - everything stitched or otherwise created by hand - that are so special. I saw the dress in a storage box, not on a mannequin; the photo, upper left, is by Winterthur, and the detail pictures are mine. 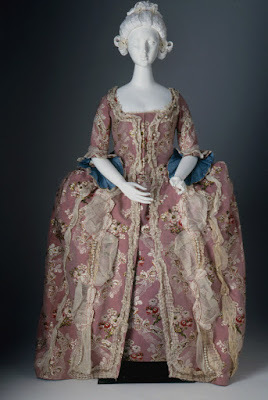 Saque dress, c1765-75, Winterthur Museum. What book is Loretta working on? I'm re-reading the Carsingtons and the Dressmakers for the nth time. First of all, I cannot imagine how beautiful the woman felt when she first put on this dress. Everything would have been fitted perfectly for her. The absolute feeling of luxury would have been wonderful. I live in today's world, I am not wealthy and I will never know what she felt. But, I know enough to realize that she was a woman who lived to look beautiful. Thank you for the detail on this lovely dress. It's beautiful! I've never seen this one, thank you for sharing it, especially the detail photos.